Action Comics #1000 hits the stands today, marking the first time an American comic book series has hit that milestone, and setting a high bar for next year's Detective Comics #1000. The issue is the anchor to DC's celebration of Superman's 80th anniversary, which has also sucked in Krypton, which airs a new episode tonight. The issue was one that almost seemed like it would never happen, after DC relaunched and renumbered its entire publishing line in 2011. Despite the assumption by most fans that it would eventually revert to classic numbering in order to take advantage of exactly this, DC denied that strategy and for years it appeared as though they really did not mean to do it. 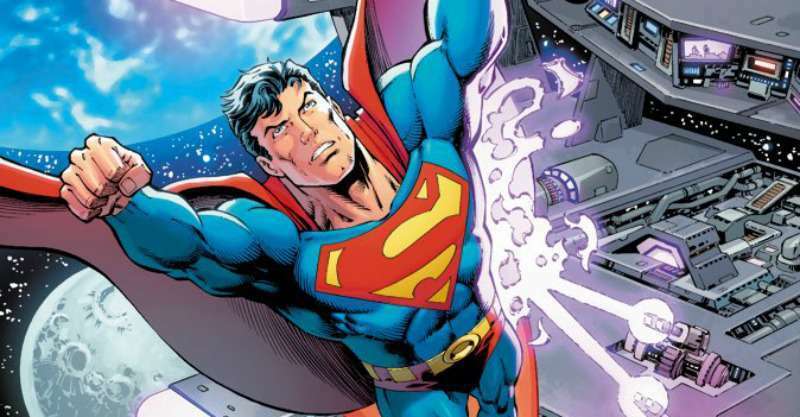 Once it was announced, it became an even bigger deal: an anthology book full of big stars, culminating with a story by Jim Lee and Brian Michael Bendis, which sets up Bendis's run on the Superman titles. As part of our normal review roundup, we wanted to take a look at Action Comics #1000, but in an 80-page book featuring 10 separate stories by top-tier creative teams, it hardly seemed like the kind of thing we could do in a few paragraphs. So, here we go: an in-depth (some more than others) rundown of the merits and flaws of Action Comics #1000, out today from DC. Slide 1 of 11"From the City That Has Everything"
Dan Jurgens, Norm Rapmund, and Hi-Fi have been a part of several big DC projects together, and so it's no surprise that this is one of the most fluid, comfortable stories in the book. All-star collaborations like this sometimes carry the impression that the teams have been slapped together and don't always gel, but Action Comics #1000 begins with "From the City That Has Everything," a story that carries over what Jurgens has been doing on Action since Rebirth and sees the veteran writer/artist drawing Superman and his supporting cast again -- something that is always welcome. Jurgens on art pushes all the right nostalgia buttons for an anniversary issue such as this, and it is nice to see him back behind a pencil, though admittedly it is not the first time recently, but it has been rare. There is a bittersweet quality to this, because Lois and Jon get a lot of page time in this story as well as in Peter J. Tomasi and Patrick Gleason's "Never-Ending Battle," but are all but absent from the rest of the book. Given the importance of Lois Lane to Superman's mythology (she, too, first appeared in Action Comics #1) that feels a bit tonedeaf and lends these first two stories an emotional punch. For her part, Lois says something that may read as odd or out of character until you consider what it is Jurgens was likely trying to do with it: while talking to Jon, she repeatedly tells him of his father's absence that "Clark" is coming. Calling him "Clark" instead of "your father" or "Dad" may seem unusual, but it was likely being used to drive home a larger point: Superman is Clark Kent, and while most of the stories in this volume celebrate the Steel over the Man, separating the two is actually nearly impossible. The story is filled with some fun Easter eggs, from Superman raising a Khund warship overhead with both hands in an apparent homage to the car from the Action Comics #1 cover to the Centennial Park statue erected after the Man of Steel's death and seen intermittently since. It also rolls out a couple of guest stars in Maggie Sawyer and Perry White, each of whom get one more significant appearance in the issue. Juxtaposed against "For the Man Who Has Everything" by Alan Moore and Dave Gibbons, the tale from which it draws its name, this story is notable in part because the "happy ending" here is about the fulfillment Clark finds from being Superman. It does away with the notion (perpetuated somewhat in Moore and Gibbons's tale) that to be happy, he has to choose between being Clark and being Superman. Again: in Jurgens's mind, they are the same guy. There is also a nice montage of "Superfeats," to borrow a phrase from Superman: The Movie composer John Williams, quickly burning through a series of images that give a sense or Superman's impact on the city. The most touching of these is the one that feels the least widescreen, which is Superman's positive impact on the life of a young man on the wrong track. Slide 2 of 11"Never-Ending Battle"
Peter J. Tomasi, Patrick Gleason, and Alejandro Sanchez give the comic what feels the most like an "anniversary celebration" story, as Superman squares off against a villain who seemingly sends him tumbling through time and space, giving audiences a glimpse at numerous major eras in Superman publishing. The story is one of the longer in the issue, in terms of page count, but because each page is a splash, it moves through the decades at a frantic clip. Ever since Superman: Rebirth #1, the reverence this team has for the character's history -- "even the grimy parts," as they say -- has been obvious. Here, they are given the opportunity to make that the story's focus. There are other elements fans will likely be glad to see in the story: besides the aforementioned focus on Lois Lane and Jonathan Kent (again, something that the issue as a whole sort of drops the ball on), fans can see glimpses of Conner Kent, Kingdom Come, and the Superman: Lois and Clark black costume/beard look. All of these elements are things that are rarely referenced in-continuity, and so finding a way to sneak them into Action Comics #1000 was a welcome subversion. A heartfelt and well-crafted story that is literally a birthday celebration for Superman, this one ought to be read in conjunction with the tear-jerking Superman #45, out this week from mostly the same creative team. For fans sad to see Tomasi and Gleason go, their final caption wishing Superman a happy birthday and adding "the pleasure was all ours" might bring a tear to your eye. Slide 3 of 11"An Enemy Within"
Marv Wolfman and Curt Swan's story is about the triumph of the human spirit, Superman's modesty, and his faith in humanity. While a little bit less technically excellent in terms of its execution than some of the other stories in the volume, it is a worthy inclusion, with both Wolfman and Swan representing significant figures in Superman's history who deserve a seat at the table. The script is new, over old art that has been cobbled together. It seems as though the bulk of the story comes from one Swan drew about supporting characters in frequent use during Wolfman's run on the Superman titles in the mid-'80s, while the final page -- a splash page featuring Superman -- is a reprinted page from Superman: The Secret Years. The result is something of an odd duck, with Superman serving as an omniscient narrator to events that he himself admits he cannot attend to or resolve. Still, the message and characterization is on point, and it was nice to see a story that centered around some of Metropolis's finest. Dan Turpin and Maggie Sawyer are great characters, and it is nice to see them getting a spotlight in a book of this magnitude. If focusing on them rather than Superman is the price to pay to have one of the most important Superman artists of all time represented in Action Comics #1000, we'll take it. Butch Guice coming on to ink Swan was an inspired choice, too: his style gels well with Swan's pencils and he has enough experience in the pre-digital comics era (Guice himself drew Superman in the early '90s) that he is able to help ease the transition of art drawn for old-fashioned coloring and art that now must be printed using modern means. Slide 4 of 11"The Car"
Geoff Johns, Richard Donner, and Olivier Coipel tell a quiet, inspirational story that's of a kind with some of the themes Dan Jurgens has explored in Action Comics #999 and #1000. It features the Golden Age Superman and the driver of "The Car" -- the one pictured on the cover of Action Comics #1, and destroyed by Superman there -- in an unpredictable and gorgeously-illustrated short. 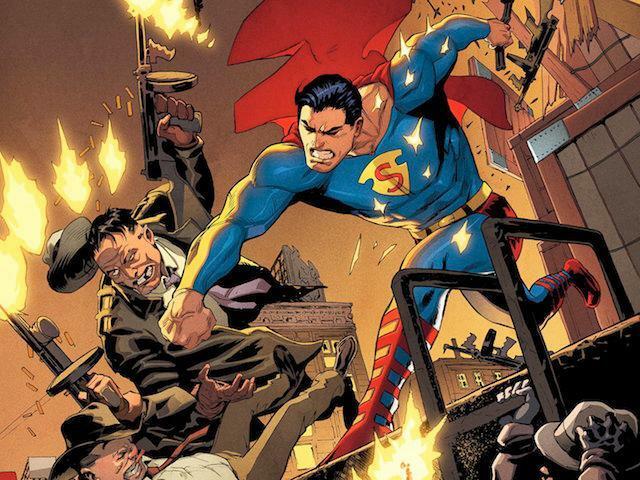 The short, somewhat bafflingly, avoids actually depicting Superman holding the car aloft as he did on the original cover, but indulges in a version of Superman who is capable of both the hot-headedness he used to engage in during the Golden Age of comics and the compassion that defines his character today. Give this one credit for something else, too: Johns and Donner make a reference to the red trunks that feels less forced than what we get later. Slide 5 of 11"The Fifth Season"
Scott Snyder and Raphael Albuquerque's story is magnificent. For audiences who grew up during the post-Crisis on Infinite Earths era, when there was no Superboy and Superman met Lex Luthor for the first time during the course of arresting him, the idea of Lex Luthor and Clark Kent being childhood friends has sometimes felt like an oddly out-of-place relic of a bygone era. Here, it is used to great effect, with Lex Luthor using the kind of silly science seen in so many Silver Age stories to peel back time itself and peer into his childhood. The shared elements of their past become apparent to the reader (though it appears not to Lex, who is so focused on his own younger self), and it ends with a small gesture filled with heart and humor -- one that feels a bit like Clark's knowing wink to the audience in Moore and Gibbons's "For the Man Who Has Everything." Colorist Dave McCaig deserves a lot of credit; while Albuquerque's moody, shadowy style is well-suited to the tale -- it takes place in a planetarium -- McCaig finds a way to make the images dark without letting that darkness seep into the art. It still feels sufficiently bright to be a classic Superman story. This is also, it should be noted, the only place in the issue where Lex Luthor really feels celebrated, too. While he did not appear in the first issue of Action Comics and is not 80 years old this year, it would be difficult to argue that he has not been one of the most significant characters in Superman's mythology over the years, and to find a way to appreciate Lex without defanging him is an impressive balancing act. 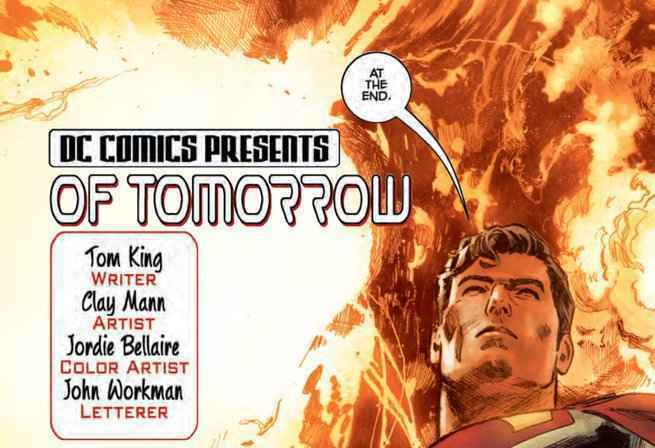 Slide 6 of 11"Of Tomorrow"
Tom King and Clay Mann's story, previously released in its entirety, is a touching and melancholy tale. The aforementioned balancing act with the colors skews a little less "bright" here, with Jordie Bellaire's palette matching King's text and Mann's somber art. This is a story in which Superman does not smile -- but one can hardly fault the creators for that. It deals with a Superman who is solitary and living at the end of the world, celebrating the memory of his long-dead adoptive parents. The iconography of Superman building a "statue" to his parents is nothing new, of course, but it is effectively done here, and the character beats all hit the right notes. It is also nice to "see" the Kents in this issue, even if they do not appear on the page since this is, after all, the post-Flashpoint continuity, and they were killed when Superman was a young man. There is some real emotional honesty to the panel in which Superman says to his late, beloved parents, "And Jon...You should see Jon. I wish you could see Jon." It really drives home the wisdom of allowing Superman to be a father, and provides not only his only smile of the story but context for the Kents' real legacy: providing Clark with a moral compass and the skills he needs to do what he does. Slide 7 of 11"Five Minutes"
Louise Simonson and Jerry Ordway, who helped to define the post-Crisis on Infinite Earths Superman alongside Wolfman, Jurgens, and a small handful of others, turn in a predictably excellent story that plays into Clark's humanity, the dichotomy of man and Superman...and most importantly delivers Bibbo! Well, for most people Bibbo is maybe not the most important part, but he is emblematic of an era of Superman storytelling in which both Simonson and Ordway played a significant role. Created by Ordway and based on a man he knew growing up, Bibbo is a barfly (and later bar owner) who grew to idolize Superman for representing a simple, understandable ideal: strength, fearlessness, self-sacrifice, and compassion. "Five Minutes" deals with crunch time at the Daily Planet as, with Perry and Jimmy lingering over his shoulder, Clark must excuse himself to go perform some superfeats, save some lives, and return to finish his story within five minutes. The result is some great material with Perry as the gruff newsman -- and serves as a reminder that one of the most exciting things Brian Michael Bendis has teased for his run on the Superman titles is a focus on the newsroom, where so many of the elements that ground Superman in his humanity "live." The story ends, as so many tales of the Byrne/Wolfman/Ordway era of Superman comics did in the late '80s, with a moment that subverts what came before it and essentially says "here we go again" while Clark looks at the reader. It is a convention borrowed from the George Reeves TV series The Adventures of Superman, and it is satisfying to see the show reflected in Action Comics #1000 in some small way (Richard Donner's Superman film and Christopher Reeve, who played Superman in it, both have a few winks and nods scattered throughout). Like in Jurgens's story at the beginning, Simonson and Ordway use Metropolis itself as a character, giving Superman a living, breathing environment to exist in and reminding us that the setting is every bit as important to the Man of Steel as Gotham is to Batman. Paul Dini and Jose Luis Garcia-Lopez craft a loving tribute to Mr. Mxyzptlk, which addresses a great truth about his character in much the same way Jurgens and Tomasi did during the recent "Superman Reborn" story arc. A spiritual (or perhaps direct?) sequel to Dini's story told as a backup in "Superman Reborn," it also features pre-Crisis Supergirl and Garcia-Lopez homaging a recent Action Comics cover, giving it a generations-spanning element that feels of a piece with what Dini did last year. What is interesting is seeing how spectacular Garcia-Lopez still is and how well-suited his artwork is to more modern coloring techniques -- something that some iconic artists from generaitons past cannot say. Of course, the larger-than-life story and Technicolor palette of the tale are helped along by Garcia-Lopez's clear lines and classic interpretations of the characters. It also, obviously, plays to the strengths of Dini, who is best known for his animation work. Slide 9 of 11"Faster Than a Speeding Bullet"
Brad Meltzer and John Cassaday pick up a thematic thread from the earlier Jurgens story and run with it beautifully, revealing a fundamental truth about Superman: even in the face of certain failure, he does not give up. Not that, it should be said, this (or the earlier Johns/Donner story) are likely picking up on threads from very recent Superman comics. Instead it shows a clarity of interpretation shared by many of the writers and artists represented here. If there is a drawback to this story, which is heartfelt and beautifully-illustrated by Cassaday and colorist Laura Martin, it is that perhaps one too many pieces of Superman's internal monologue focuses on the "speeding bullet" part rather than the "faster" part. It loses some of the emotional honesty that makes the story great and feels oh-so-briefly like discarded sciencespeak from an issue of The Flash. That is, though, a minor quibble with an excellent story -- and one which, again, reminds the audience of one of the fundamental messages Superman is meant to convey: that in some small way, we can all be Superman, if only we allow him to influence us. Slide 10 of 11"The Truth"
Brian Michael Bendis, Jim Lee, Scott Williams, and Alex Sinclair set up the next era of Superman in a story that introduces Superman's latest villain, and both ties into the events of the Jurgens/Tomasi years and sets the stage for a new and more Krypton-centric take on the Man of Steel in Bendis', well, The Man of Steel. Bendis and Lee's story feels somewhat out of place in this volume, self-indulgent and ugly in a book full of generosity and beauty. The villain is like Doomsday, and it seems that's what the story aims to be: it's fast-paced, brutal, and action-driven. Rogol Zaar is ugly, violent, one note -- and tied to Krypton. Like "The Death of Superman," this story is likely a prelude to something grander and less grim. But unlike "The Death of Superman," this story does not really stand up on its own. The big reveal at the end of the issue takes readers deeper down a rabbit hole that Jurgens had explored, fulfilling Bendis's promise to fans that he would not retcon or "forget" elements of the popular Rebirth run on Superman. The deep dive Bendis is teasing seems to be taking a personal story with personal scope and blowing it up to be cosmic in scale. There is some real potential there, but it's a high risk/high reward situation. That reveal, coupled with the absence of almost any recognizable Metropolis characters and the presence of Supergirl (who doesn't do much, but appears on a few pages), seems to suggest that to Bendis, Krypton is a huge part of what makes Superman interesting. This is not Lee's best work -- it feels rushed, perhaps because Bendis was hospitalized around the time Lee would have been starting this work -- but of course he is a phenomenally talented artist, so it still looks great, even when you get a few very wonky panels or pages (Superman crashing through the LexCorp tower and doing absolutely no damage to the building looks...off). Alex Sinclair's colors are a bit baffling in this one, too: shadows feel a little heavier than they should, lending some of the pages a muddy feeling. In what appears to be lighting effects (there is a fire nearby), one character has skin so pale that it seems literally white in several panels, lending an everyday person a kind of creepy, undead affect. Rogol Zaar is where Sinclair's talent really shines -- his face is like an alien Two-Face, and blended nicely -- but the aforementioned shadows hang heavily over him, giving a never-before-seen character an off-putting look and never quite allowing readers a clear look at him. There are some great character beats by extras in the story. Bendis chose to keep Superman mostly unconscious, presumably so that it could be the villain's story, and this gave him the opportunity to write a few Metropolitans into the story who could essentially act as the reader. Throughout the scene, two women are talking about Superman, wondering aloud about the return of the trunks (it's never explained in any of the stories in this volume, although one could argue that it does not really need to be), and being terrified by the villain. The only downside there, aside from the jarring brutality of the story, is the fact that this story comes at the tail end of a story that celebrates and elevates Superman, only to have the incoming writer close out the book by telling a story that rips him down from that pedestal and kicks dirt in his face. It is not an inherently bad story or even a bad idea, but there is a kind of tonal clash which makes the reader wonder whether there might have been a better or more appropriate venue to tell this particular tale. A Superman who does nothing of narrative value and spends most of the story unconscious seems like an utterly baffling first story from Bendis. What kind of statement is he making about his take on the character? The rest of these stories seem to be trying to say something about Superman. All Bendis and Lee seem to say is, "Brian Michael Bendis and Jim Lee did a Superman story!" Action Comics #1000 arguably serves better as a celebration of Superman's history than as a tool to set up his future, although in ongoing comics the two are always intertwined. The clarity of vision in most of these stories, and the sense that DC seems to finally agree amongst themselves on just who Superman is and what he means, is heartening and produces an excellent comic by any metric. "The Truth" remains the elephant in the room, however. It is impossible to ignore that this is not only not a good story, but that it has no place in this particular issue. 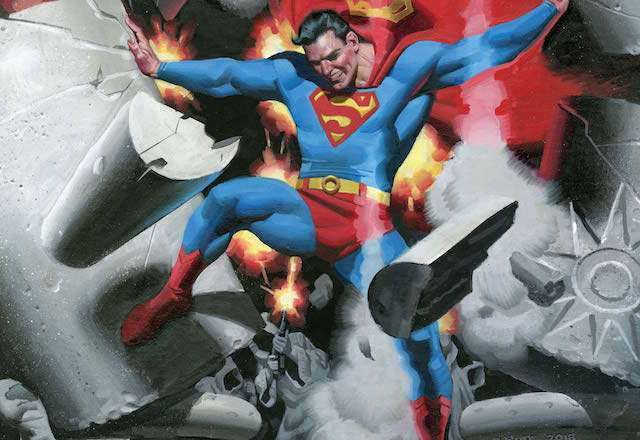 Lacking the context and comparisons offered by its company in Action Comics #1000, the story would still not have been good, but likely would have seemed less bad. That said, it will be the story most fans are talking about, and the one the media focuses on, since DC has promoted the book that way and has set up Bendis as the franchise's future. When the New York Times runs an article featuring the headline "Can This Man Save Superman? ", it becomes inescapable that for many, "The Truth" will be what this book is about...and "The Truth" hurts. Another quibble, but one worth mentioning: there is no real acknowledgement within the pages of Action Comics #1000 itself of the book's own significance, of the character's publishing history, or of the writers and artists that made it all possible. Certainly there is an extent to which such a celebration is implicit in the pages of this anthology, but it would have been nice to see it made plain. DC, of course, has another venue for that. Today also sees the release of Action Comics: 80 Years of Superman, informally known as the "Action Comics #1000 hardcover." That book does include text introductions, an unreleased story by Jerry Siegel and the Joe Shuster Studio, and other elements that make it a true celebration of the title's history, but it is an expensive hardcover book, and not part of the ongoing monthly series, so to celebrate there obscures the celebration from the view for most readers. If sales figures are any indication, more comic book readers will be picking up Action Comics than almost any comic book in recent memory -- especially one at its hefty price point. That is as it should be, as there is a lot to love in this volume. It is not perfect, however -- and what's frustrating is that you can't really add "...but not for lack of trying" to that sentence.